We are called to equip the saints for works of service (Eph. 4). The problem is, we struggle to do it. Instead of equipping the people in our congregations, we do the work of 20 people, get frustrated and wonder why no one is showing the potential and desire to become leaders. Here’s my hunch: We pastors are the problem. 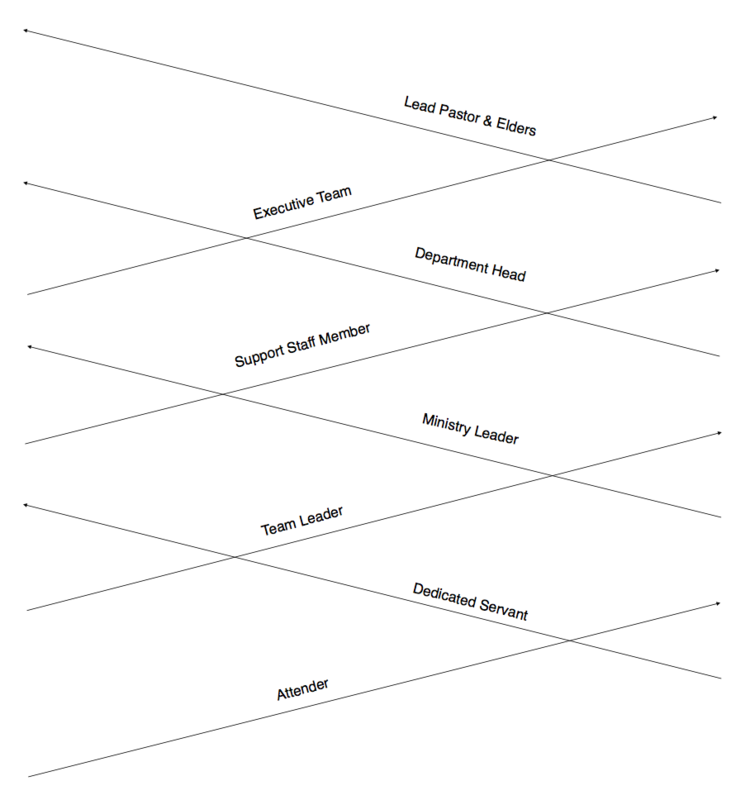 A leadership pipeline is a framework and a path that allows you to create a developmental plan for each level of leadership in every ministry of your church. The leadership pipeline gives your church the needed structure to be intentional in every aspect of leadership development, from onboarding into the nursery to serving as an Elder. The goal here is to see people be invested in and developed to meet their full potential. The leadership pipeline well executed will make your church a thriving church where a greater percentage of people are doing the work they are called to do. Dedicated Servant – someone who joyfully and consistently serves in their current role, displays self-control by leading his/her self well, and displays growth in his/her faith. Team Leader – someone who leads a team within a ministry, who displays the values of delegation and empowerment, and who is spiritually investing in a group of people. Ministry Leader – someone who oversees an entire ministry, who connects the church’s vision with the ministry’s vision and purpose, and who is intentional with coaching their team leader within their ministry. Support Staff Member – someone who is a paid staff member responsible for assisting in the tasks and/or responsibilities within a department. Department Head – someone who is a paid staff member responsible for the leadership and direction of an entire department. Executive Team – someone who is a paid staff member who collaboratively shapes the organizational vision, shares critical responsibilities and determines organizational strategy. Lead Pastor & Elders – someone who holds the office of Elder at The Crossing—protecting and guiding the direction and spiritual well-being of our local church. The church has been lagging behind in leadership development so I turned to the business community. Let’s face it: The business community has been on the cutting-edge of this and we can learn a lot from them. With an eye to see transferable principles, I highly recommend you pick up a copy of The Leadership Pipeline: How to Build the Leadership Powered Company by Ram Charan, Steve Drotter and Jim Noel. It’s a business book filled with information and insight we need to have in the church. Instead of just buying a single copy, I bought a copy for each of our staff members. The first chapter is worth the price of the book, but I encourage your entire leadership to get this book and quickly work through it in its entirety together. If you’re already part of the RP email community, then you have a link to this in today’s email. If you’re not a part of the RP email community, you can join now and get access to our entire free resource library. Skills – developed abilities ranging from teaching to managing and beyond, dependent on the leadership level. Time Applications – the necessary thing(s) that require time at a given leadership level as well as the expected quantity of time required. Values – the principles that guide behavior within a leadership level. The goal here is to develop a clear picture of what a person in a given leadership level in a given ministry looks like. This will take some time because of the nuance of every ministry and every leadership level. In this step you’re asking this question: What skills, time applications and values does the ideal person need to possess at this leadership level? The more you dive into the book I recommended in step 1, the better you’ll be able to do execute this step. In the Building a Leadership Pipeline Packet there is a worksheet to help you in this step. Once you have the training profiles complete, you’ll flip your perspective from top-down on the visual pipeline to bottom-up. Here you’re not simply asking what do these levels of leadership look like, but you’re asking how do we train people to move through their current level and up to—and through—the next level. So, with your profile worksheet in hand and your training content worksheet in hand, you’re going to break down specific learning experiences to help someone move into and through the level of leadership of focus. This begins with onboarding. At the onboarding stage, you’re going to take the profile of the dedicated servant level and deconstruct (then construct) how to get someone to the point that they can do their role effectively. Then move on up the pipeline by using the next profile and the next and so on. This is the step we are moving into at The Crossing. Here you’re going to take your training content worksheet and create (as well as curate) the pieces of your training curriculum. At The Crossing, we’re going to be creating a lot of videos and checklists as well as curating articles, videos and books for the training curriculums we develop for every level of leadership in every ministry of our church. This is going to be the most time-consuming piece to building a leadership pipeline in your church. But when it’s done, you’ll be able to simply iterate and improve. If you want to host your training content online, you can use Teachable (which has a free option) or you can build your own membership site (which is what I’ll be doing). I’ve also heard great things about TrainedUp.Church. Check them out, too. Now that everything is in place, your job is to identify people who are ready to move to the next level, invest in them, develop them through your training curriculum, and review their progress. In the Building a Leadership Pipeline Packet there is a review worksheet to help you in this step. Are You Ready to Dive In? Want Video Teaching on This Topic? Join the conversation and let us know. You can do so on social media: Join our Facebook Group, tweet us or post on our Facebook Page. If there is enough interest in some video teaching on this topic, I’ll create some more in-depth training for you.